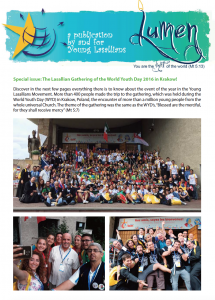 The October issue of Lumen, a newsletter for Young Lasallians, features Lasallians who gathered together for World Youth Day in Krakow, Poland, from July 25-31, 2016. World Youth Day provides a unique opportunity for young Lasallians from all over the world to gather together for community and mission. This issue of Lumen features a brief summary of attendees, personal accounts from World Youth Day, testimonies, the vocations center at the event and a look forward to World Youth Day 2019, which is to be held in Panama.